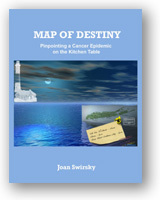 The retail cost of the book is $15.00 plus shipping and handling, resulting in a $5 contribution directly to Breast Cancer Help; however, donations exceeding this minimum for the purchase of “Map of Destiny” will greater support our programs and efforts in the fight against breast cancer. 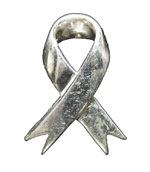 A silver charm ribbon designed by Fire Island artist and jeweler Kenny Goodman is being sold to promote breast cancer awareness and raise funds to fight the deadly disease. Goodman has pledged 18%, or $6.30, from the sale of each $35.00 ribbon to Breast Cancer Help, Inc. Donations exceeding this minimum for the purchase of Awareness Ribbon jewelry will greater support our programs and efforts in the fight against breast cancer. 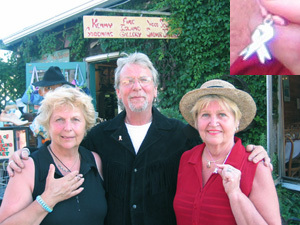 Pictured (from left to right): Sue Muscarello of Manorville, artist Kenny Goodman, the owner of Kenny Goodman Jewelry in Fire Island; and Lorraine Pace, co-president and co-founder of Breast Cancer Help, Inc. show off new silver ribbons that were designed by Goodman to help raise awareness and funds to battle breast cancer. Or, you can use your PayPal account or credit card to donate online, quickly and securely.